Formed in early April 2010, LAGITAGIDA, is planning a global expansion. LAGITAGIDA is a super-powered attack instrumental rock band. This strange band name "LAGITAGIDA" is an original creation straight from the mind of the bands founders to emphasize sound, nuance, and rhythm. The band name features their stoic attitude, serious atmosphere..., and unique sensitivity which blend these elements in perfect balance. The members are certainly accomplished in their own individual careers. 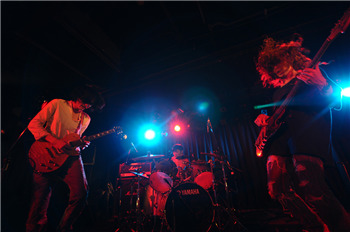 They are influenced by wide range musicians including Frank Zappa, Led Zeppelin, King Crimson, Can, The Mars Volta, Battles, Metallica, Slayer, and Melt-Banana. LAGITAGIDA’s sound is intense. They encompass an intoxicating reflection of all their influences. 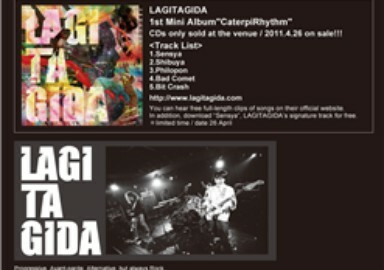 In April 2011, their first and long awaited mini-album “CaterpiRhythm” was completed. The track that best embodies LAGITAGIDA, “Sensya”, is a memorable first song for the band and a great lead track for the album. LAGITAGIDA declared war on the indie rock world with this piece.